Here we explain the choices, selection, and use of gutter screens to reduce gutter clogging and to reduce the frequency of gutter cleaning chores. We address the question of whether or not installing gutter screens actually save work. COMON GUTTER SCREEN PROBLEMS - Do gutter screens work? Which ones work best? Unlike gutter caps (that we find often don't work as well as expected in many installations), gutter screens can permit roof runoff water to enter the gutters while keeping out large debris and thus slowing the rate that gutters clog and overflow. Indeed, properly installed, gutter screens can reduce (but not eliminate) the need for frequent gutter inspection and cleaning. Watch out: just because you have installed gutter screens, don't think you never have to inspect or clean the gutters. You will need to perform those tasks, though less often than without the screens. 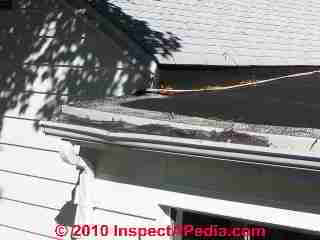 Some common gutter screen problems are discussed and illustrated just below. Our photo (above left) illustrates a recent gutter screen installation we requested for the edge of a high standing-seam metal roof on a New York home. (Photo courtesy Galow Homes). At above right are the pine needles and debris that had leaked through the gutter screen to clog the gutter downspout end drop four years later. At SNOW GUARD FAILURES we further illustrate what else happend to this gutter. The height of the roof makes it difficult to access, more so given a crowded area at ground level making ladder placement difficult. The roof covering is metal. Although we can actually access this low-slope standing seam metal roof fairly easily by placing a ladder on a lower roof surface to reach the upper one, the metal surface is quite slippery - dangerous to work from. 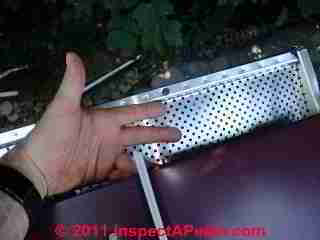 The gutter screen design includes a lip (you can see it on the outer edge of the gutter screen, next to my forefinger in the photo) that makes the installation neat, easy, and a nice fit on the gutter edge. Maple leaves will probably wash right off over this lip. But there are nearby pine trees - there is a real risk that pine needles will accumulate behind this lip and ultimately clog the gutter screen. We'll report back with some photos when we see how this screen performs. To remove the screen for occasional gutter cleaning (which we hope will be infrequently, less than once a year) will require on-roof access to remove some sheet metal screws. A hinged clip-on type cleanout door at each end of the gutter would have been a nice detail, (though we suspect the installer feels that most homeowners just won't pay for such added help). 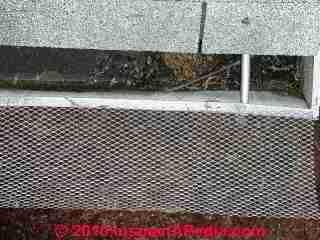 Gutter screens installed with no provision for inspection or cleaning of the gutter (photo, below left). Use a hinged or otherwise easily-removable gutter screen so that gutter maintenance is easy and thus might actually be performed. Gutter screens that are improperly installed, damaging roof shingles (photo, below right). Solid "hat type" gutter covers or "screens" - how well do they work? Our photos below show a solid gutter cover that promises "you will never have to clean your gutters again". We see this neat gutter cover on display at home shows and in shopping malls with water running continuously over the gutter cover and neatly into the gutter through a space between the cover's outer edge and the outer lip of the gutter itself. Do these gutter covers work? Sure. 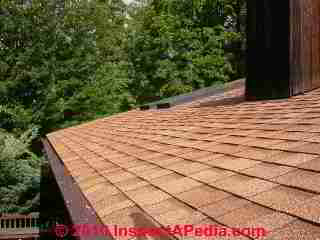 Leaves blow nicely off of the roof edge. But some limitations and concerns with solid gutter covers are listed just under our photographs. Roof shingle damage: you'll see that because this was a retrofit installation the installer placed the screen under the first course of roof shingles - that's ok but not if you tear the shingle tabs during installation (photo above right). That triangular drain opening at the bottom of the roof valley (above left) is intended to prevent high volumes of water from overshooting at the valley and missing the gutters entirely during heavy rains - a good installation detail, though if you look closely you'll see that the roof valley extends under the perforated screen where it will block nearly all of the desired drain opening - we suspect this roof valley overshoots the gutter during heavy rain. Pine needles and hemlock or other fir tree droppings cause problems for these and just about any other gutter screen. Those smaller debris particles wash right over the gutter cover edge and into the gutter where they accumulate and eventually clog the gutter. One of the worst basement water entry cases we investigated was traced to this problem. Heavy hemlock trees close to the roof (see also TREES & SHRUBS, TRIM OFF BUILDING) conspired with "permanently installed" solid gutter covers to clog and spill roof drainage along the building foundation. The owners, convinced they had "forever" gutter covers on their home, never inspected the gutters for clogging and never cleaned them. Gutter overshoot: In heavy rain the capillary action that makes solid gutter covers work may be inadequate and the gutters will overflow. This may or may be a problem depending on weather conditions in your area. Access panels: The solid gutter cover installation should have left readily-removable access panels at each end of the gutter to make it easy to inspect and clean the gutters - a detail we rarely see installed. 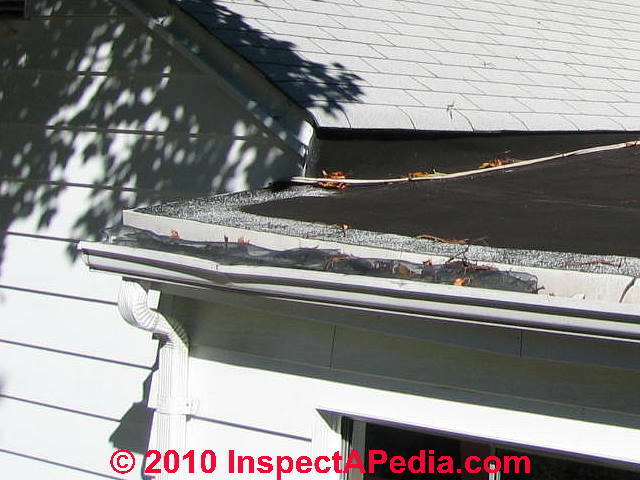 Gutter ScreenTroubleshooting: Question: What Else is Wrong with my Gutter Screens? I’ve been looking for information on the proper installation of the aluminum gutter screens you see in the attached photo. The one that is closest in the picture is the one I’m primarily concerned with because all of it was installed laying on top of the shingles at the top edge (photo, below-left). That piece you see furthest in the picture was just a piece that looks like it was added because they ran out. In the second picture (below right), the top edge is pushing the last row of shingles up. 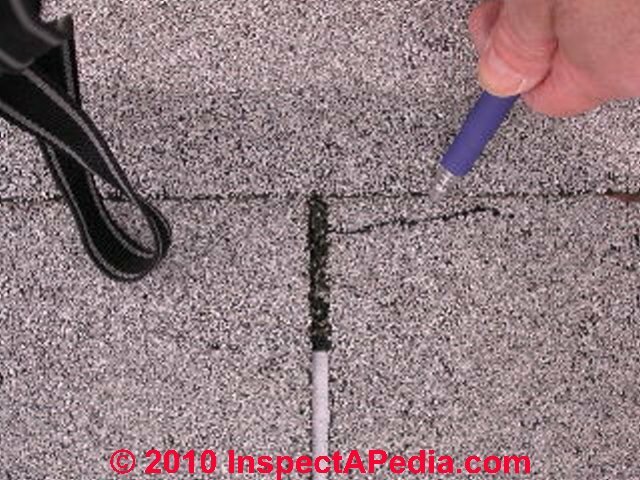 - S.S.
We're not certain from just the photo, but the gutter screen at the right side of your photo (above-right) looks like a model that is intended to make it easier to inspect and clean the gutter when needed. These screens incorporate a hinge that clips to the outer edge of the gutter. The screen can be flipped up for gutter inspection or cleaning. 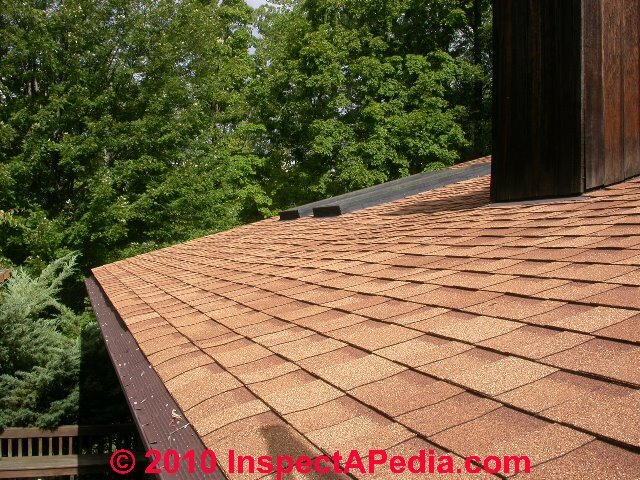 The gutter screen at the left of the photo depends on having been spring-fit between the shingle edges and the inner edge of the aluminum gutter. It too can be removed and replaced, though not as easily, and its spring-fit design sometimes leaves a high bulge (not in your case) that traps leaves and debris up-roof of the screen. We prefer the hinged gutter screen design, as we discussed above in this article. Your second photo shows buckled roof shingles at the lower course just above the gutter screens. 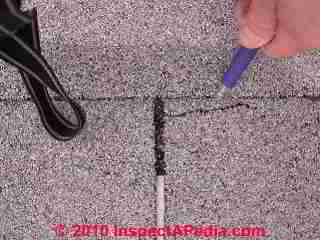 Buckling asphalt roof shingles lead to earlier wear and failure of those shingles than others on the roof, as we find both granule loss and cracks occurring at the apex of the buckled section. If your roof shingles are still flexible enough to lift without breaking, you might want to try carefully placing the upper edge of the gutter screen under rather than against the edges of the shingles. Readers should also see GUTTER CAPS where we describe this different approach to trying to avoid having to clean roof gutters. Also see TREES & SHRUBS, TRIM OFF BUILDING for advice on avoiding leaf and pine needle clogging of roof gutters. This article series discusses how to choose, install, diagnose & maintain roof gutters & downspouts, & roof drainage systems to prevent building leaks and water entry. Continue reading at GUTTER CAPS or select a topic from closely-related articles below, or see our complete INDEX to RELATED ARTICLES below. 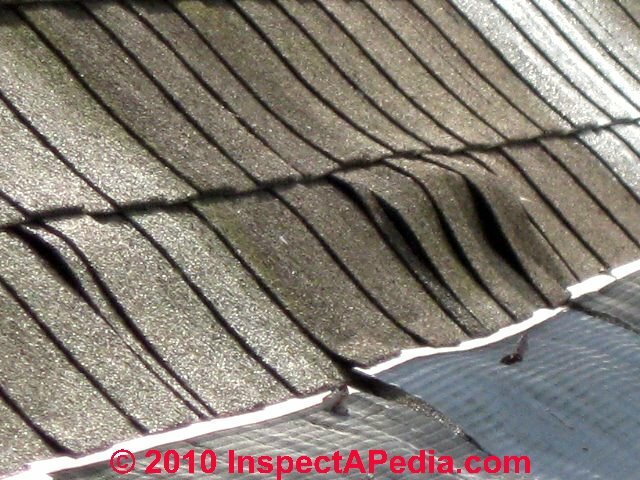 GUTTER SCREENS at InspectApedia.com - online encyclopedia of building & environmental inspection, testing, diagnosis, repair, & problem prevention advice. Questions & answers or comments about choosing, installing, & repairing gutter screens to keep out leaves & debris.